Our bus driver and guide was Aubree from Atlanta, and she told us a lot about the area. 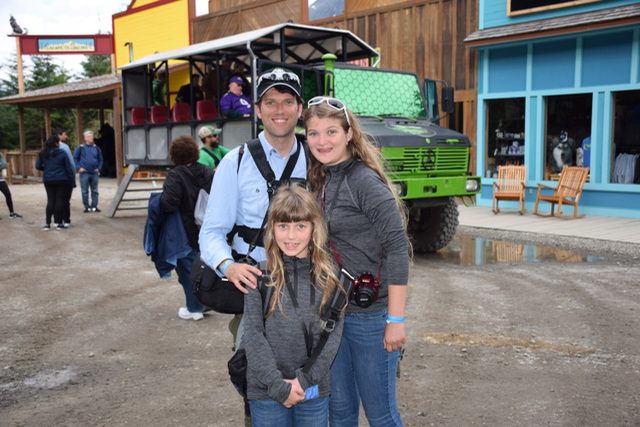 The current population of Skagway is less than 1,000, but in the height of the Klondike Gold Rush from 1896 to 1891 it was around 20,000. Most of the historical buildings in Skagway have all been moved to Broadway in downtown. The downtown area covers four blocks by 22 blocks. 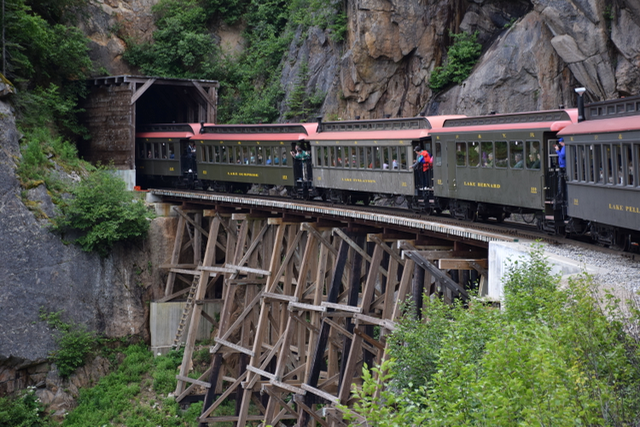 Skagway started as a railroad town for the construction of the White Pass Railroad. The railroad was started in 1898 and followed one of two main trails the miners used. At the train station we boarded train car 308 of the White Pass Railroad for a trip up from sea level to 2,885 ft in Fraser, BC. I spent a lot of time between the rail cars so I could see the beautiful scenery without looking through windows. Along the route we crossed two bridges up in the mountains and went through two tunnels. Along the way we saw several waterfalls, including the Bridal Veil Falls. Legend says that if you drink from the water in this waterfall, you will be engaged in six months. Our bus driver Aubree said that the drank from it and it will be 6 months on December 24. Once we made it into Canada, the land was covered with some type of plant/flower that looked like gold. Before getting off the train customs agents went through all the cars to check passports. Fraser really only contains a train station, and almost all the residents are customs agents. 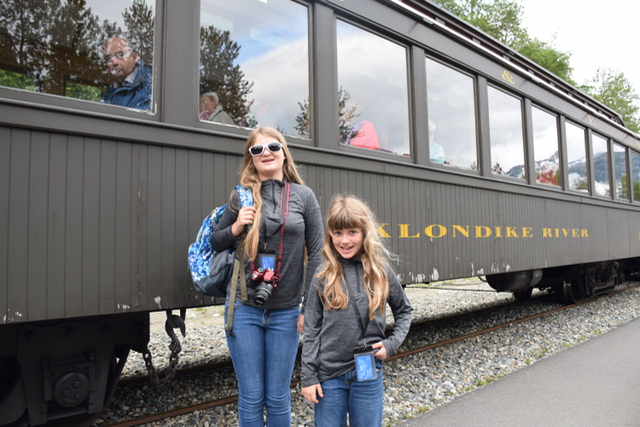 Off the train, it was WAY colder at elevation, but we quickly boarded the bus and headed back down the Klondike Highway toward Skagway. This is the only road into Skagway. 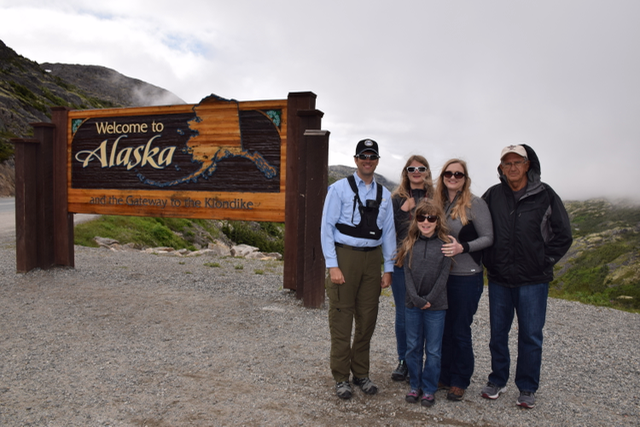 We stoped at the U.S. border and took a quick picture by the “Welcome to Alaska” sign. She also mentioned that the most dangerous animal in Alaska is the moose, which can run up to 35 mph. If available, you should stand behind a tree, because it will easily confuse you with tree. If no tree is available, then you run zig-zag, because moose have eyes on each side of their head, and it makes it difficult for them to see you. All the way down we saw these upside-down L-shaped poles lining the road. These are to mark the road boundaries in the winter for snow plows. The road is practically hanging off the mountain. 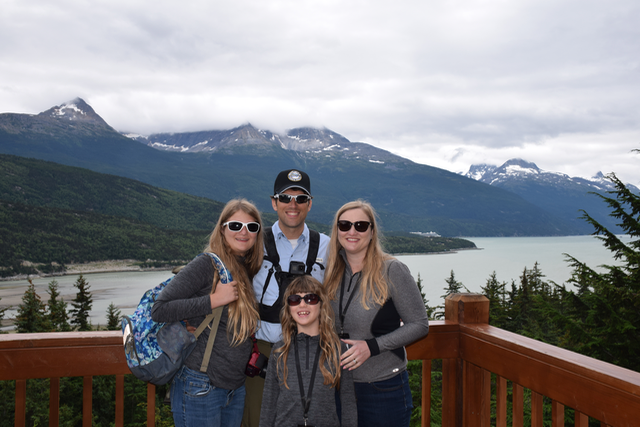 Back at Skagway, we stopped at Dredge City to pan for gold and have a yummy BBQ lunch. 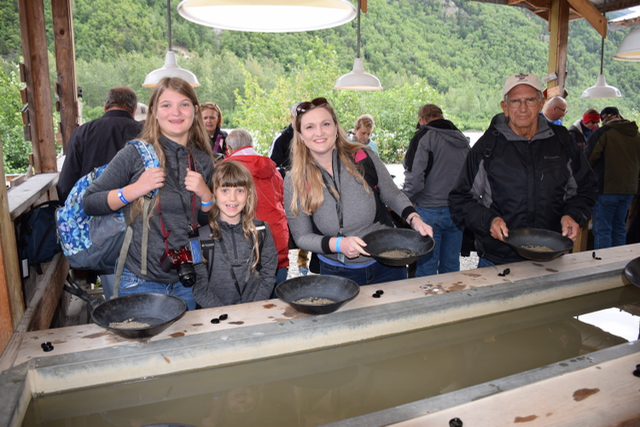 As we were panning for gold, they told us that no gold was ever found in Skagway. After lunch, Aubree dropped us off in town and we walked around a bit. 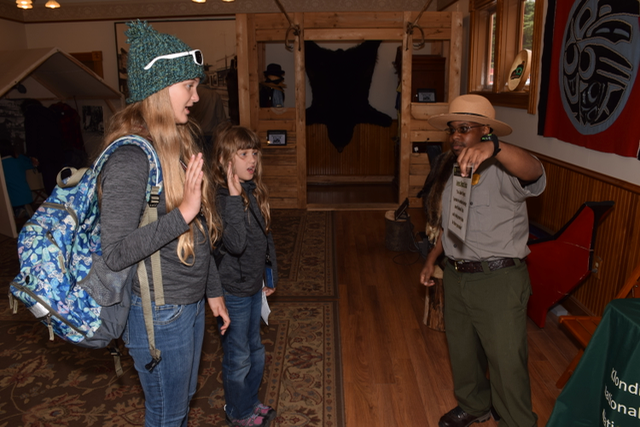 We took the girls to the National Park Service to get their Junior Park Ranger Badges for the Klondike Gold Rush National Historical Park. That makes four now, with 396 to go. We also enjoyed some ice cream downtown and then walked back to the ship to board the coach for our next tour. 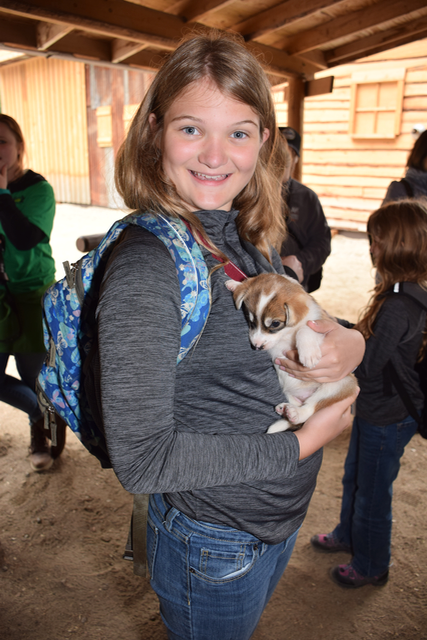 For this one, our driver Blake took us to Dyea to ride a cart pulled by Alaskan Huskey sled dogs and to play with puppies. On the way he told us a number of things about Skagway. 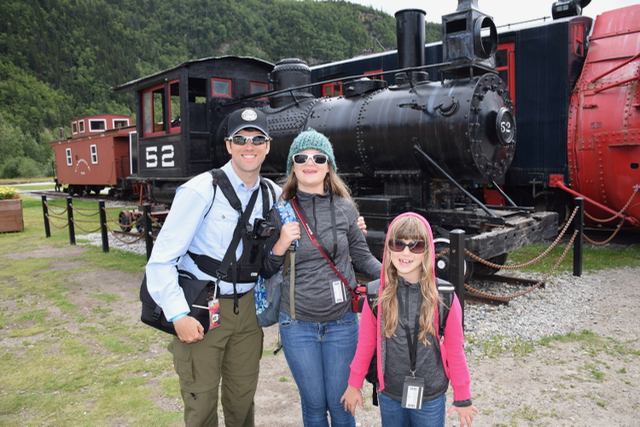 800,000 people visited Skagway last year. As we passed a funny looking building that looked like it was made of sticks with the letters AB on the front, he told us that it was a climbers society that requires completing certain climbs to be a member. There are no doctors in Skagway, and the cost to get a medivac to Juneau is $35,000. The Skagway airport can only service single engine planes. A gallon of milk in Skagway costs $8 and it takes a month for Amazon Prime 2-day delivery. The Skagway river that runs through town is completely glacier fed and is dry in the winter. We took the last left-hand turn on the Klondike Highway before it crossed the Canadian border and started making our way to Dyea. It was a dirt road for most of the way and many of the homes in Dyea don’t have electricity. They have to re-grate the roads on a monthly basis. The old city of Dyea is completely overgrown as it died once the railroad opened in Skagway. On the way we crossed the Taiya River over a one-lane bridge. 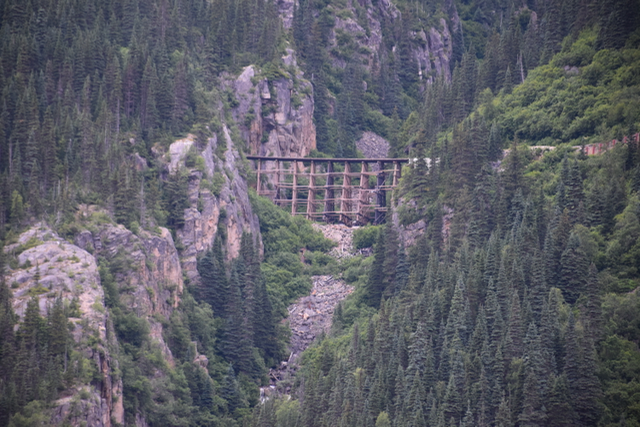 It had originally been a bridge in Juneau, but had been condemned. They sold it in halves and what we crossed was one of those pieces. The dog kennel we visited is owned by 11-time Iditarod champion Ryan Remington, and his grandfather actually founded the race. They have approximately 300 Alaskan Husky sled dogs. 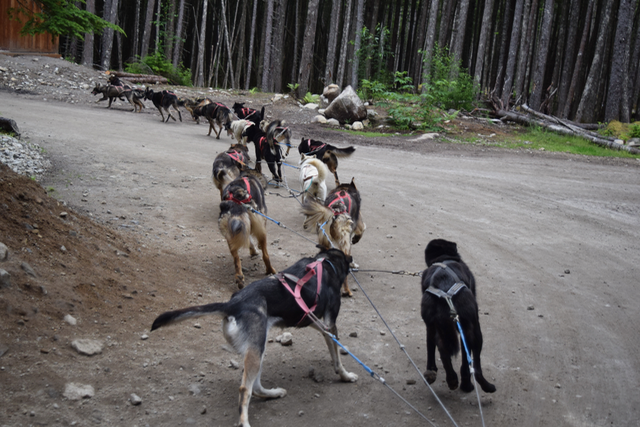 Once we arrived at base camp, we took a gigantic vehicle, called a Unimog 1,000 feet up the mountain to an area where they train the sled dogs. The Unimog seats 24 and has a maximum speed of 15 mph. It was like being on a theme park ride for 10 minutes. At the top, we boarded a 6-person, metal cart and were pulled by 16 sled dogs around a one mile track. 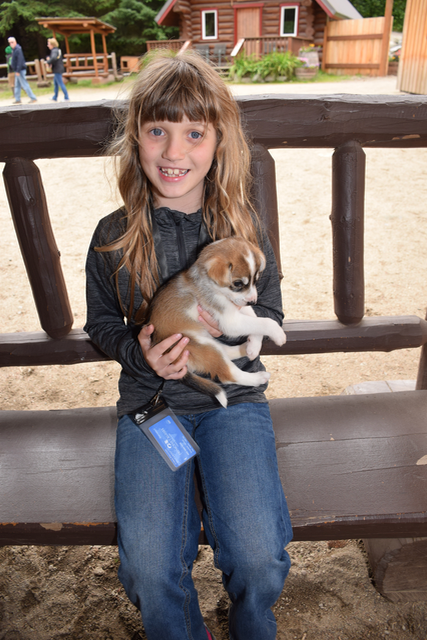 Our musher was named Denver, and she competed in the Jr. Iditarod last year. I’m guessing she was no more than 15-years-old. She said that she had been racing sled dogs for six years, and currently has two teams. One is made up of racing dogs, and the other puppies. We had the puppy team. She said that a typical Iditarod sled will weigh 200 to 300 lbs, but this training sled weighed 2,000 lbs. This is used during the summer to build muscle for racing season in the winter. After the run, we got to spend a little time petting each of the dogs before heading back down the mountain. At the bottom, another Musher named Bones talked to us for a while about the Iditarod and we got to see Ryan Remington’s sled that he used in the 2016 Iditarod. Bones said that a sled like that would typically cost around $3,500. On the sled they are able to carry three 50 lb bags containing food and clothing. The dogs wear booties to protect their paws from the ice and need about 6,000 calories per day. They have checkpoints every 60 to 90 miles where they can refresh supplies and have the dogs checked out by a vet. The dogs are run for four hours, and then they eat and take a two to three hour nap. This pattern is repeated throughout the race. 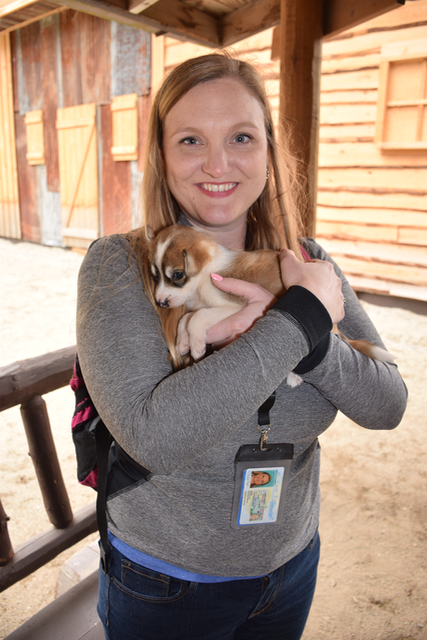 After the presentation we got to spend some time playing with sled puppies. The youngest two were only 3 1/2 weeks old and they were absolutely adorable. On the way back to the ship, we were able to spot a sea lion in Tayia River, which was cool. We enjoyed another awesome dinner in the Bordeaux Dining Room, and for three straight nights we’ve been in the section of Andor from the Philippines. He has been with Princess for 13 years, and is hoping to soon be able bring his family along. Tomorrow we have the day in Juneau, Alaska’s Capital city!